« Rock’n’Roll Seattle Marathon Training, Month 1: Preparing for Bigger Things to Come. Hi all! I’m so glad that I finally got the courage to put together another episode in the Tried and True Recipes series, in which I’m going to share five vegan recipes by other bloggers or food writers/creators that I’ve been making over and over in the past few months. You can see all of the previous episodes in the Tried and True Recipes series here. Today’s roundup sounds like one heck of a feast if you were to serve all of these at once: a sandwich, a soup, a pasta dish, a stir-fry, and some delicious baked donuts for dessert. This recipe for Portobello Mushroom Bacon was popping up in my Pinterest feed quite a bit a few weeks ago, so I finally gave in and made some for a low-key dinner. The recipe is easy and fairly quick – the longest part was waiting for the mushroom slices to marinate, which doesn’t count as hands-on time. The resulting mushroom bacon had just the right amount of sweetness and smokiness – Rob was especially thrilled with the flavor! It wasn’t as crispy as that other, you know which one, kind of bacon, but the crunchy lettuce in the BLT gave the sandwich just the right mouthfeel. Changes I made: I skipped the coconut oil and lightly sprayed the pan with oil spray. Piece of advice: try to slice your Portobello cap as thin as possible to allow the pieces to get crunchier during cooking. Use two pans at a time to cut the cooking time in half. 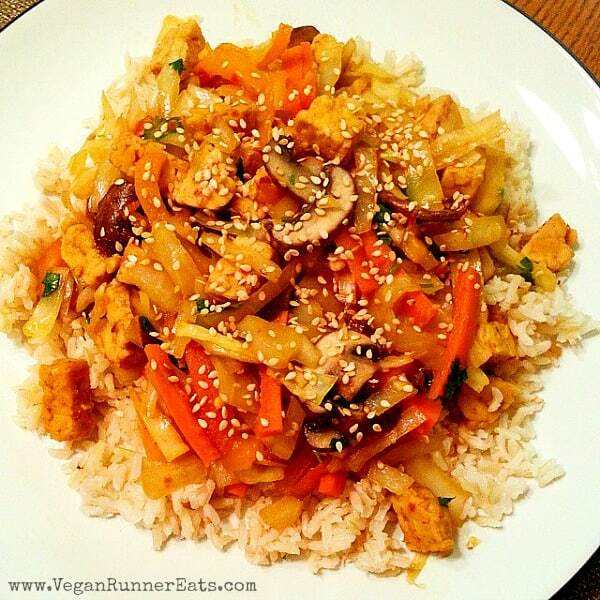 Remember the Virtual Vegan Potluck 2014? Oh, what a lovely vegan feast did we have in the interwebs! (Here’s the recipe for Broccoli-Apple Winter Salad Tacos that I brought to the party.) 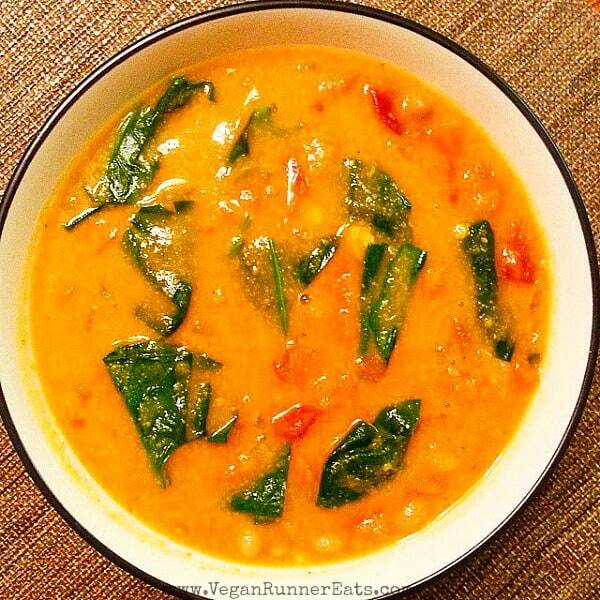 Anyway, during the potluck I discovered this Curried Pumpkin Peanut Soup submitted by Dianne of the Chic Vegan blog. A creamy, comforting broth with the flavors of roasted pumpkin and peanut butter, with kidney beans and spinach bathing in it? I knew right away that I had to make it! In case the idea of peanut butter in a soup seems odd to you, trust me: it works! Besides, there’s been at least one or two soups or stews with peanut butter in my culinary rotation, both inspired by Aftican cuisine. Give it a try, and unless you hate the creamy taste of peanut butter, you’ll be impressed! Changes I made: I used roasted butternut squash instead of classic pumpkin, and crunchy peanut butter instead of the creamy kind to eliminate the need for chopped peanut topping. Ahh, the lusciously smooth Alfredo pasta… Can you believe that before I went vegan, I didn’t really care for pasta, particularly the creamy types? Eating pasta with dairy-based Alfredo sauce seemed to me like an equivalent of gobbling up sticks of butter dipped in heavy cream. Those days are long gone, and now that I’m a vegan (and a lucky new owner of a Vitamix as of recently), I appreciate everything creamy and tasty. Bonus: the absolute majority of creamy vegan pasta recipes are waaaaay healthier and less fatty than their non-vegan counterparts! Enter this amazing recipe for Pumpkin Seed Alfredo Pasta by my vegan friend Renee, the creator of Fire and Earth Kitchen – a Seattle-based business that provides vegan cooking classes, chef services, food prep demos, etc. all around this lovely Pacific Northwestern area where we live. I reviewed a couple of Renee’s classes over here. Since Renee isn’t a food blogger per se, she doesn’t publish her recipes left and right, but this recipe for Pumpkin Seed Alfredo pasta is an exception. I have lost count of how many times I’ve actually made this pasta at home – this alone should be an indication of how much Rob and I like it. It’s easy, quick (30 min maximum from when you look up the recipe on your phone to when you sit down to eat), and the flavors are just sublime. 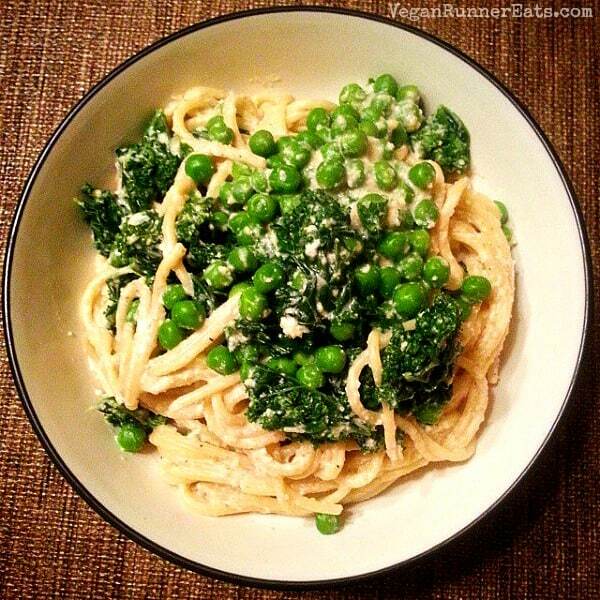 You can feel extra good knowing that pumpkin seeds in your Alfredo sauce are loaded with iron, and kale and peas – well, do I even need to list the benefits of kale and peas here?! Changes I made: None. The sauce works well just the way it is. My only note: If you don’t have fresh kale handy, you can use broccoli and/or cauliflower instead in the same manner. Bibimbap is a traditional vegetable dish from Korean cuisine. I heard about it before, but never had it until I stumbled upon Vegan Richa’s review of Robin Robertson’s new cookbook, Vegan Without Borders . Richa shared Robin’s bibimbap recipe from the book over here. I had almost all needed ingredients at home except for a rather crucial one – Korean hot pepper paste called gochujang. I took upon myself a risk of making a substitution, and used sambal oelek paste that also happens to be an Asian hot pepper sauce (somewhere a Korean grandma is laughing at me furiously). The result? It was dee-licious! So much so that Rob expressed his delight with the dish at least five times the very first time I made it! He even asked to put it into our regular rotation. I made the bibimbap a few times since then, and most recently it was prepared with the gochujang paste I had finally bought at a local Asian store. Believe it or not, both Rob and I liked the sambal oelek version better. Are we weird for that? Changes I made: I used sambal oelek instead of gochujang paste as described above, plus added a block of tempeh. To reduce oil, you can use oil spray for the pan, and up the amount of toasted sesame seeds at the end. Also, I served the stir-fry over rice, not mixed it in as the recipe suggests. 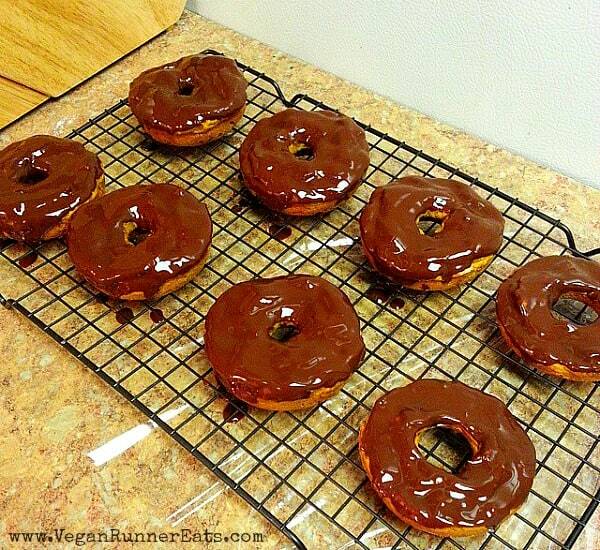 This recipe for Sweet Potato Donuts by Vegan Richa has been on one of my Pinterest boards for a year before I decided to give it a try, namely because I finally bought a donut pan. 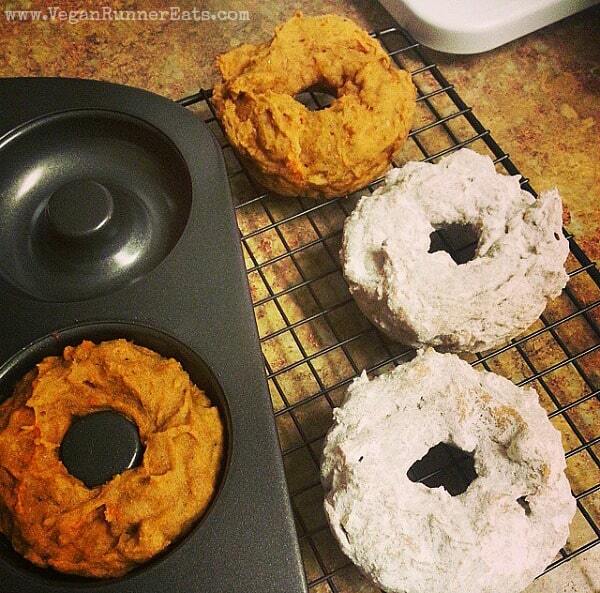 The idea of mildly sweet donuts with delicious spices resembling pumpkin pie sounded intriguing. Plus, I’m a fan of sneaking in a healthy vegetable in any recipe it doesn’t normally go. Rob and I experimented with different finishing touches on these donuts: he coated one of the batches with powdered sugar (above), and I dipped another batch in chocolate glaze (below). To make the glaze, I melted a handful of semi-sweet chocolate chips in the microwave with 1 Tbsp of almond milk, dipped one side of each donut into the glaze after the donuts cooled off from baking, and let the glaze set before the donuts were put away. So, how good are these? Let me just say: I recently brought one of the unglazed donuts to work to have as a midmorning snack, microwaved it for 30 seconds to warm it up, and a couple of my coworkers walked over to my desk and asked me all kinds of questions about what was generating the magical spicy aroma! Changes I made: since neither Rob nor I are gluten-free, I used the regular whole wheat pastry flour in this recipe instead of spelt, and omitted cornstarch. I hope you’ve found a few interesting recipes to try out in today’s post! 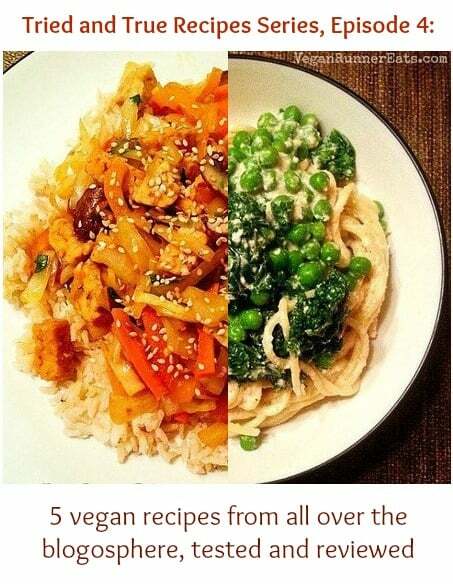 Now it’s your turn: what new vegan dishes have you recently tried and loved? Please share below! Click here to see other posts from the Tried and True Series. Tagged soups and stews, tried and true recipes, vegan bacon, vegan blogosphere, Vegan Richa. Bookmark the permalink. So glad you enjoyed the soup! I’ve made it with butternut squash puree before and it tasted pretty much the same, so I think any type of squash can be used. Thank you for the recipe, Dianne! I think I might try using canned pumpkin next time and see what happens. so glad you made the doughnuts! and so happy about everyone coming over to get some:) spelt is a form of wheat. i use spelt as it makes less dense baked goods 🙂 ww pastry flour is a good sub! Richa, you would have been very impressed if you saw how much commotion your donuts made at my work! I promised to make a batch and bring it in one of these days. Good to know that spelt makes these donuts less dense, I should find some! 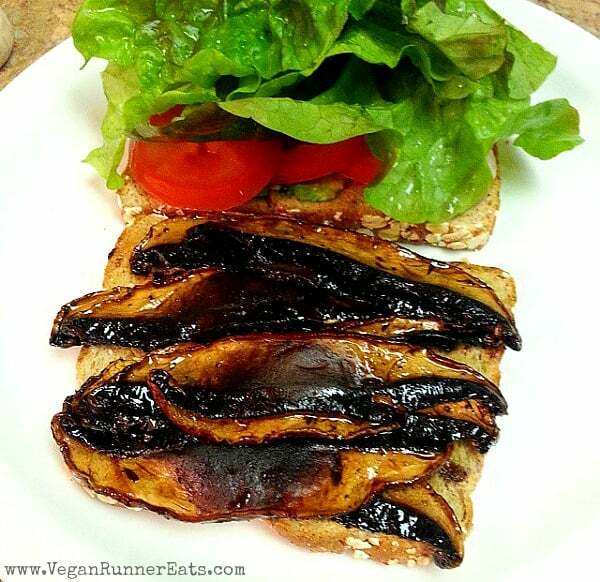 Alina, thank you for sharing our Portobello bacon with your readers! So happy you like it!! You’re very welcome Linda, thank you for a great recipe!